The correct unit for measuring energy capacity of a battery product is called watt-hours. Watt-hours signifies that a battery can supply an amount of watts for an hour. For example, a 60 watt-hour battery can power a 60 watt light bulb for an hour. The same battery would run a 5W phone for 12 hours and power a 1W LED light bulb for 60 hours. Watt-hours is a simple and consistent way to measure the capacity of any battery pack, whether it’s a Nickel Metal Hydride (NiMH), AA battery, the 12V lead acid battery in your car, or the lithium ion battery pack on your laptop. Laser offers battery packs in all of these configurations, and they are easily comparable by looking at the watt-hours rated to each one. What is the difference between watt-hours (Wh) and amp-hours (Ah)? Amps and Milliamp Hours are only half of the equation. Since different batteries may have different voltages, amp-hours is only useful for comparing products that have the same battery configuration. If you want to be sure that you’re getting the right results, use watt-hours for an apples-to-apples comparison. Airlines now compare batteries using Wh. Be sure to have a battery with less than 100Wh for travelling on planes. The Laser Power Bank Charging Station is for the whole family. Each colour-coordinated portable Power Bank works with a variety of portable electronics. From phones and tablets to cameras and more. 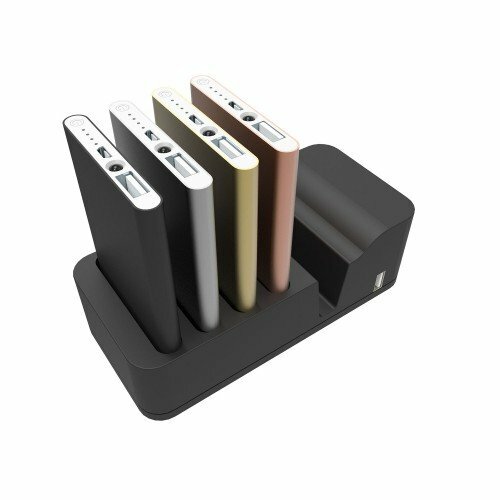 Best of all, you can recharge all four Power Banks at the Charging Station base alongside your phone or tablet. Now everyone's powered and ready to go!